The Sidecar. Photo by Donna Turner Ruhlman. Some cocktails seem worthy of making based on the name alone, regardless of what’s in them. Since reading that there was a cocktail called a Sidecar 20 years ago, I’ve wanted to make one. But the brandy threw me off. Brandy is an after-dinner sipper, not a mixer. And if it’s just brandy, rather than Cognac, why bother at all? And if it is Cognac, why mix it? But damned if the Sidecar didn’t keep itchin’ at my heart, wanting to be scratched. I loved it for its simplicity, 2 parts brandy, 1 part orange liqueur (such as Cointreau), 1 part lemon juice (which seemed like a lot of lemon—¼ lemon juice). I happened to be shopping at a good independent grocery store here in Cleveland called Heinen’s, and they had a basket of Meyer lemons, which I’d never seen in a grocery store before, so I bought some. On Wednesday, considering the return of the Friday Cocktail Hour, and with the Sidecar still a itchin’, I remembered the lemon. Meyer lemons are a little less acidic, a little gentler, with a lemon-orange aroma, which might sync nicely with the Cointreau, I mused, stroking my imaginary mixologist’s beard. But the brandy. If we’re going to do this, I thought, let’s do this right. Donna and I had returned in August from Southwestern France with a bottle of Gascony’s very special brandy, Armagnac, the best of which are almost always produced by small family vineyards (unlike the big Cognac houses). I had bought mine from from a gentleman named Alexander Ladevese, a 2004 vintage made from ugni blanc grapes, one of the main Armagnac grapes. The sidecar is very much a sour drink, which I think balances the intensity of the brandy. I’m sticking to the traditional proportions, but it’s a matter of taste. Add a little more Cointreau, use the even sweeter Grand Marnier, or add a splash of simple syrup or fresh orange juice to reduce the pucker factor. It lends itself to variations, such as the Ritz Sidecar. It’s up to you. Be prepared to adjust to your sweet-sour liking. This is a lovely fall cocktail. At last, a Sidecar. Combine the fluids in a cocktail mixer or in a mixing glass. Fill the vessel with ice. Give it a swirl or a stir. Retrieve cocktail glass from freezer (or pre-chill your glass with ice and water). Swirl and stir the cocktail till it’s well chilled, not much more than a minute. Strain the drink into the frosty glass and garnish with Meyer lemon slice. Swirl and stir the cocktail till it’s well chilled, not much more than a minute. Strain the drink into the frosty glass and garnish with orange slice. This can serve one or two. My past posts on all the Friday Cocktail Hours. The role of cognac in classic cocktails. Wikipedia’s take on the history of the Sidecar. I’ve been searching for a cocktail to ease the transition from summer (gin and tonics) to fall. This might be it, especially because I like my cocktails on the sour, as opposed to sweet, side. Thanks! The block you describe here is one I suffer from with almost all cocktails. I tend to lump spirits into two groups: those I enjoy sipping straight and those I’d sooner forget. I had no idea what a sidecar was until just now, and I still don’t think I’m likely to make myself one anytime soon, but I think I might seek one out now–I do prefer something sour. The Sidecar became my favorite cocktail a couple of years ago. Although the way I make it, it might not be considered a “real” sidecar; I use cognac and I serve it on the rocks. Sooo good! A Sidecar may not be a good drink to order in a restaurant or bar unless you feel comfortable confirming with the house what recipe they use for the drink in question. I’ve seen some truly strange things go into that innocent glass, such as bourbon, sweet and sour mix, simple syrup, and grapefruit.juice. The results ranged from undrinkable to interesting, but none were Sidecars in the usual sense. And, as at home I probably wouldn’t use a vintage champagne for a champagne cocktail, I’d stay away from rare brandies when it comes to everyday cocktail drinking. Ask at your local liquor store for a recommendation, but stay away from the cheap stuff; if you wouldn’t drink it alone, find a brandy that you would. I prefer mine without the sugared rim, but that’s just me; sour and proud of it. Ken – Amen to your observations. I believe in using good ingredients, but using a brandy that’s too refined may be a mistake as the subtleties of the tastes would be masked by the citrus and the Cointreau. Michael -I haven’t made a sidecar with Armagnac before, but as it’s one of my favorite brandies, you’ve inspired me to try. I have made very good ones with a relatively inexpensive Spanish brandy called Fundador. It’s a little bit sweeter than most good Cognacs and therefore cuts through the intensity of the lemon. agree wouldn’t make a weekly habit of the fine hooch mixed drink, but I just loved that bottle that armagnac and that meyer lemon, had to. And raise your glass in good health, I say. It’s really about appreciating a great ingredient, isn’t it? For special occasions and holidays, I’ll make a batch of Manhattan’s using a particular rye whiskey, Carpano Antica for vermouth and a particular brand of maraschino cherry that makes me cry when they ring me up at the register — but it’s a fine and wonderful drink to share with friends. Cheers, Mr. R! I made the mistake recently of ordering sidecars from a bartender who didn’t know what a side car was (they had good ingredients alcohol wise) but despite my explaining him how to make it he ended up using his recipe book that somehow involved sweet and sour mix, roses lime and yes top shelf cognac. So we laughed and drank them but learned our lesson. The orange “stuff” I use in place of Cointreau or Grand Marnier is Mathilde Liqueur Orange X.O. It is, like Grand Marnier, a Liqueur au Cognac, and I find it delightful in comparison to the other two. You might want to give it a try sometime. I will use it to make your Sidecar, and I will also use the Armagnac as you suggest. Glad to have Friday Cocktails back. It’s a great way to start the weekend. Have a good one. You can make your own Grand Marnier or Cointreau quite easily. Take a bottle of good-but-not great brandy or vodka, respectively, infuse with the zest of three large oranges for a week, strain, filter, add double-rich simple syrup to taste. Boom, you just saved a ton of money. And from there you can get a little more adventurous with other fruits and spices. Brandy is a great base spirit for infusion experimentation as it isn’t as ostentatious as whiskey or tequila. Great choice on a fine cocktail. And that is so very brave of you to use the precious lovely elixir that you transported all the way from France. I would have put it in a cupboard for a small occasional sip, but you sir, have put it to great use! Now where is the Ruhlman ring on that stem? Grasped by the base? I have no idea how you & Donna get those shots, and I hope you get to enjoy the beverage and have a great weekend – all! never heard that before, like it! That made me laugh out loud. I’m not much of a drinker — I get sick easily — but that looks just delicious. A great-tasting cocktail, beautifully presented. 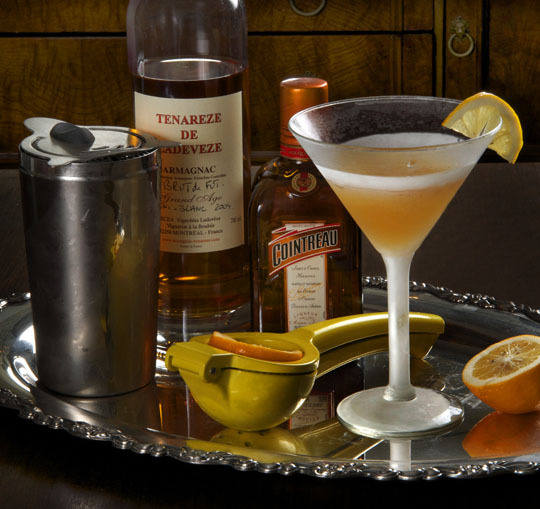 As the weather worsens, I’ll point you toward a Brown Derby – which in my mind is one of the higher uses of Bourbon. All hail the return of the Friday Cocktail! So, the Meyer lemon thing hit me last week as well–I grabbed some at the store, simply because they had them, and then decided they were best used in the Whiskey Sour recipe from a few months back–so good. Bob, please don’t tease! I had my first Derby a few weeks ago–bracingly good. What is a Brown Derby? I remember Dad drinking a beer in little brown bottles called Brown Derby. Of course there is the hat also. I can’t recall if the top twisted off. The beer bottle, not the hat. There was a great restaurant in Corvallis, OR: Le Bistro. They served a drink called a Beautiful: 1:1 cognac and Grand Marnier. I have a single Meyer lemon on my tree. (Yes, it’s a small tree). Now I know what to do with it! I do 3:1:1 and use Francois de Lyon Cognac, Cointreau, and regular lemons. Korbel Brandy is a great domestic brandy V.S.O.P. and X.S. (vanilla infused) Please don’t overlook what the United States produces. The sidecar was my grandmother’s favorite drink. Traditional recipe with lemon juice, Cointreau (and ONLY Cointreau, no triple sec!) and brandy. She drank them on the rocks, and they often made them by the pitcher. A fairly lethal drink! For a great domestic brandy, try Germain Robin from Ukiah, Ca – they have different price points, but when you get down to brass tacks – who cares. Cheers – I’ll try your formulation at my next occasion. This is a favorite drink of mine. I thought the classic ratio was 1:1:1. Oh, and there is at least one other really incredible cocktail using cognac: The French 75 as served in the French 75 bar in Arnaud’s in New Orleans uses cognac (and at Arnaud’s, Cointreau, Mum’s champagne, and lemon juice are the other ingredients. Having cognac and Mum’s as well brands is pretty remarkable). You’ll see non-New Orleans recipes for the ’75 using gin in place of the cognac, but I promise you want the Arnaud’s version. The name is from French artillery in WWI. And it really packs a wallow you don’t expect. We have a rather fantastic French brasserie in Richmond, VA, and so on this past Saturday when I visited for lunch, I asked if they had any Armagnac. They had exactly one – Clés des Ducs – so I asked for a sidecar with that and Cointreau. It was delicious, and the tart aciidity went well with my crouque monsieur. VA is a regulated liquor state, so I can’t seem to find any Armagnac to make this on my own at home, but it was good enough that I’m likely to order it out in the future. Oh, I am so happy to see you posted a sidecar! One of my favorites. As mentioned, one to be careful about ordering in bars (I’ve had some awful renditions – if they ask for clarification, I order something else). We recently had a surfeit of pisco thanks to traveling friends – the pisco sidecar is a nice twist. One of our favorite restaurants makes one with cachacha. Delicious.